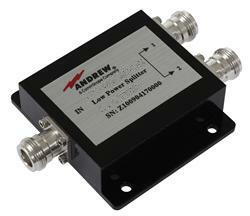 Andrew’s multiband, power splitters are designed to evenly split low power RF signals with minimal reflections or loss. The wide frequency range allows use with single or multiband antennas and radiating cable systems. The multiband frequency range includes SMR/Cellular, PCS, and UMTS. The multiband splitters are designed for indoor/outdoor (IP65) use.